Mrs. PFD recently received a new Banana Republic card in the mail. I thought they were downgrading her since as far as I know we didn’t spend enough in 2016 to keep Luxe status (in case you’re wondering, Luxe status isn’t worth much unless you’re really into Gap brands), but instead it turns out the Banana Republic is moving people from its Luxe Card to a Signature Visa. Gap’s reward system is straightforward, so the 2X rewards on all spending actually makes this a legitimate 2% everywhere card. You could counter that in fact the value is less than 2% since technically the rewards are worth less than cash, and technically you would be right. But then, you’re not the kind of customer they’re going after, are you? I think this is actually a good value proposition for the Gap Brands target customer. Keep in mind that most people don’t optimize their credit card spending, so if they see they can get 2% back on everything with their cards, that’s not a bad deal. The one thing that’s interesting to me is the 3X reward points on everything for one month out of the year. It’s not interesting enough to cause me to use the card given my valuation of BR rewards and the other credit card spending options I have, but it’s not a bad idea. It’s always fun to talk smack about credit card marketing, but overall I think the new card is a solid effort from the Synchrony / Gap team. One final note: the official minimum credit limit for a Visa Signature card is $5,000. Most Synchrony retail cards have low credit limits, around $1,000 or so. My wife’s card is $6,000, but that’s only because we requested a credit line increase to capitalize on a 5X everywhere promotion. So maybe Gap will have two different cards for elites going forward? I don’t know. Luxe cardholders, if there are any of you reading this, please chime in. the new Signature card (I thought the same thing, that I was being downgraded). The way it is worded, it sounds like there may be some rewards that are above and beyond the Luxe status. They could bed just telling everyone that though so they feel really special. Visa Signature Accounts: Select Accounts may also be upgraded to a Gap Inc. Visa Signature Account at the discretion of Bank. Gap Inc. Visa Signature Accounts will earn the benefits listed above (as a Gap Silver, Banana Republic Luxe or Navyist by Old Navy Account), plus additional benefits that will be communicated to the cardholder at the time of upgrade (such additional benefits may include additional points earned for purchases, additional birthday bonuses and select benefits provided by Visa USA). Interesting, thanks. Based on this I would guess they’re going to upgrade everybody with a CL above $5K (or whatever the absolute minimum required for a Visa Signature is). I am a signature card holder. But, the CL is not just set to 5000.00, it is set just like any visa, MC etc. credit card. I believe based on your income and creditworthiness. Any idea if the signature cars will still have the bonus categories throughout the year like 5x points outside brand, 100pts per day used, or 5x point for dining etc? I don’t see why not, I haven’t noticed any changes in offers since the change. Is this a Metal Card? 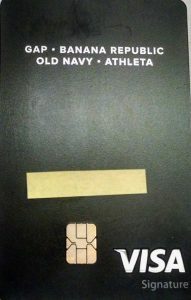 Is this card available after silver status only to Banana Republic Members or GAP Credit Card members as well?